In a world where new companies are popping up left and right, company culture is more important than ever. It helps you hire the best teammates, helps you retain the happiest team, and often translates into happier customers and overall company growth. Take the 2014 Fortune 100 Best Companies to Work For, for example. Revenue for these companies increased by an average of 22 percent last year, and they hired five times more new employees than other companies. We can all mostly agree that a company’s culture impacts their capacity for success. The question that many startup founders and HR directors need to ponder is, “How?" How should we promote and influence the company culture? How can we leverage our culture to inspire our team and our customers? And what IS and IS NOT company culture anyways? The good news is, you’re not in it alone. Culture-building is a team effort, and should be treated that way. The bad news is, you can screw it up. There are things that can be done to support and influence the company culture’s direction. But efforts to rush it’s existence or force a culture’s definition can feel disingenuous, and can even become toxic to other areas of your business. For instance, paying high salaries, offering extravagant perks, and adding an aquarium to your office may make employees happy, but could lead to a false sense of “we made it”. Lowering employees sense of urgency, impacting response times to customers, and stifling innovation. In this scenario, customers get the short end of the stick. 1. Start with “why” in everything your business does. Do your customers know why your company does what it does? Do your employees? Most companies describe themselves first by what they do, then they may go into more detail on how it all works, and somewhere on their website maybe there is a mission statement explaining the why behind it all. But, you’ll have a hard time finding it most of the time. These days everyone is building a better mousetrap. So, if you want to win over hearts and minds, you need to go above and beyond explaining what your widget is and how it works. You need to make it abundantly clear to both your employees and customers why you are in business. The best way to do that is to make your why a focal point in everything that your company does, because just posting a mission statement somewhere isn’t good enough. In your hiring, you’ll attract better fits for your team if you share with them why the company exists, why you love working for the company, and why customers love using your product. When planning your product roadmap, share with your team why customers will benefit from getting certain features sooner, why those features will help grow the company, and why building them helps you live up to your company’s mission. Simon Sinek, author of Start with Why, says it best, “People don’t buy what you do, they buy why you do it." This is true for inspiring both your customers and your employees. 2. Don’t list your values. Know and prove them. It’s one thing to write out a list of the values you want for your company, it’s another to actually live those values. After thorough discussion with your team, you have collectively decided on key words or phrases that represent how you want to work together, create value, and engage the world. You maybe even added them to a poster on the wall as a reminder to employees. The missing step is making sure your company’s values are actionable. Discuss with your team how each of the values can actually be implemented and proven in everything that your company does. From the way the company website is presented, to code documentation, your terms of service, your offices, and especially in how you work with customers and each other. If someone outside of your company asks someone on your team what the company values are, the employee shouldn’t need to be reminded. They should be able to give a good answer, because they live those values every day through their work. Strive to make your company values as self-evident as possible. You’ll know your company is doing a great job when customers start to notice and call them out. 3. Wear your company culture for the world to see. Your company culture can be a huge competitive advantage, if you only let it shine. Showcase elements of your company culture, and your company will attract more people that identify and resonate with those elements. Whether they are prospective new employees, partners, or customers. HubSpot does a great job of showing off their culture with their people, in nearly every video they produce. From their Inside HubSpot video that talks about what it is like to work at the company, to their product and customer case study videos throughout their website. Buzzfeed shows off their love for sloths in the product as an “easter egg”. Just click anywhere on their site, and execute the ol’ Konami Code with your keyboard (Up, Up, Down, Down, Left, Right, Left, Right, A, B). And, MailChimp is one of the best companies in the world at showcasing their company’s personality in their marketing, through their mascot Freddie and the voice and tone of their copywrIting. Our culture at Front is far less visible than the examples above, but we are starting to find ways to share, especially with our love for Legos. We buy Lego sets for team members on social occasions, we put Legos in product mockups, and we even have the entire team in Lego characters. Legos don’t have anything to do with what we do at Front. But when we send some out to our customers, they immediately know who they’re from, and they’re able to have a glimpse of the people behind the product they use every day. 4. Don’t be stingy with company equity. It’s tempting to use money as a main motivator for employees to come aboard, or to hit certain performance goals. Because, well, money has a way of motivating people. Today’s best talent, more often than not, is going to be very interested in having equity, even in lieu of higher salaries. The very best of them are going to know how much they are worth. Offering more equity to attract and retain talent has its benefits. Employees stay focused on driving the value of the company up to boost the value of their equity, and the savings from paying lower salaries can be spent on other things, like hiring more people. As part of a promotion. To keep long-term employees motivated. All of these factors help create happy employees that are more dedicated to their work and loyal to the company. Customers get to maintain relationships with members of your team longer, and more value gets delivered to the market faster from less turnover. 5. Give employees opportunities to recharge. Working long hours and rarely taking breaks may boost short-term growth, but can be damaging in the long-term as employees grow sick, tired, and unmotivated. That’s why a lot of companies have implemented incentives and other creative solutions to let employees recharge and renew their creativity. Every Friday, Zurb “let’s loose for 15 minutes of creatively to create a fun culture and grow relationships.” They’ve even open sourced their weekly creative challenges to let other teams in one the fun. A growing number of companies, like Netflix and Hubspot, offer unlimited vacation days. Others like Moz and FullContact, actually pay for paid vacations to encourage employees to take the days off they’re entitled to. According to Moz CEO Rand Fishkin, these perks are essential to keeping amazing people on his team. 6. Actually use your analytics data. Is your company fully utilizing your analytics data, or is it just something marketing plays with every once and awhile? All departments in your company can find real value in analytics. It just requires the investment of setting up (made easy with Segment, Popcorn Metrics, or TrialFire), knowing what you want to track, and a process for actually taking action on the insights. A big step in the right direction is to showcase your company’s key metrics on a data dashboard, presented on a flat-screen TV or projector for all to see. The screen doesn’t have to be huge, but should be centrally located in your office space to encourage people from any department to share ideas on how metrics can be improved. This effort alone will make employees more focused on improving whatever metrics you are displaying. Like response times for customer inquiries, or the conversion rate on the website. 7. Put everyone in the company on the front line. Everything comes down to creating happy customers, and getting more of them. So, everyone on your team should have at least some interaction with customers to learn how to do that better. The benefits are many, and can be visible throughout your organization as your company increases their collective knowledge on how to better serve the needs of customers, and address their biggest pain points. A great start is by having everyone handle customer support. If not ongoing, at least get your team involved in handling support intermittently, taking turns providing support through email, social media, live chat, or even in person. Companies like Amazon, Zappos, Olark, Kayak, and even us here at Front, invite team members from all departments to help out with customer service duties. This helps make sure that we never lose touch of what really matters: our customers. The inDinero team goes as far as organizing weekly in-person meetings with customers. According to inDinero CEO Jessica Mah, companies need to “get out of the building and actually watch customers use the product”. Transparency in your company’s communication may sound like a crazy idea. Why would you want to share your email inboxes, as well as all the key information you have access to, with everyone on your team? Well, for starters, making your communications transparent for your entire team to see and access will breed trust, accelerate decision-making, and simply make it easier for your team to do their jobs. The first step in this direction is to set up the right tools. Stripe and Buffer use intricate Gmail filters to make sure everyone receives every email, without getting their inbox too crowded. Reddit invites employees to communicate on general channels on Slack instead of one-to-one rooms. And at Front, well we use Front to share all of our inboxes with each other. Including our various shared email accounts, our SMS, and Twitter account as well. Getting new hires up to speed fast. Enabling other team members to easily handle email while you’re out. Putting all the great conversations your team has with customers in Front of people throughout the company, that normally wouldn’t see them. 9. Ditch the corner offices. If you are in leadership, everyone already knows. You don’t need an office to prove it. And, there are many benefits to working amongst your team, rather than secluding yourself in a closed-off room. Employees will be more willing to share their thoughts and ideas if they can just walk up to their managers’ desk, and ask questions instead of queueing up outside their offices or checking with the receptionist to see them. At Stripe, for example, CEO Patrick Collison doesn’t have an office or even a desk for that matter. He changes where he works everyday to make sure that he stays in touch with everyone in the company on a more casual level. Evernote put their management teams in charge of the coffee shop in their offices. They all have 1-hour shifts throughout the week, enabling all team members to come and talk over a cup of coffee. This not only gives your employees a voice, it also enables teams to work better and faster together. When everyone knows what others are working on, and feel like they can ask anyone anything, decisions can be made straight away. 10. Consciously choose to be positive every day. Were you in a positive mood, or did you at least portray one, when you came into work today? Attitude is contagious, and yours could be rubbing off on the rest of your team, as well as your customers. According to Harvard’s Shawn Achor, “something as simple as writing down three things you”re grateful for every day for 21 days in a row” significantly increases your level of optimism and happiness. Practice this method as a team by discussing 3 things you are grateful for from the previous week. Try replacing negative words in your speech as much as you can with positive words, especially when sharing criticism or bad news. Carolyn Kopprasch, Buffer’s Chief Happiness Officer, noticed that her conversations with customers improved the day she stopped using “no”, “but” and “actually”. Mention items you think are great about a co-workers work, before discussing what you would do differently. Simply hire happy people. They are more fun to work with, and already know how to communicate positively. If you or your team need additional help finding ways to be more positive, there’s an app for that too. 11. Treat feedback as a gift. Feedback isn’t an invitation for debate, it’s an opportunity to learn a different perspective. Be empathetic of anyone offering you feedback, whether they are your employer, employee, or customer. Simply acknowledging the feedback, asking thoughtful questions to better understand the situation, and then repeating what you understand can go a long way. Feedback is pivotal to anyone’s, or any organization’s, growth. So, when you receive it, don’t just try to remember what you heard or read, write it down! Create a Trello board for product feedback, website feedback, feedback on the blog, etc. Create a spreadsheet to store feedback from customers. Keeping a record on each piece of feedback, who it was from, and what is being done about it. 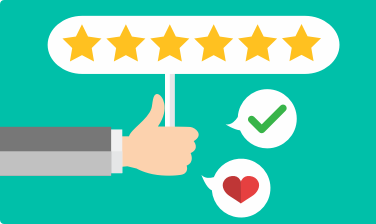 If you are using a CRM to manage sales and customer success, log NPS scores and any feedback you get from prospects or customers in your CRM tool to reference in future conversations with them. Whenever you receive personal or professional feedback specifically for you, take note of the feedback, who gave it, and what you think you can do about it in Evernote. Know that even if the recommended action in the feedback is not taken, you should be able to learn something from the feedback, and do something with that learning. Your company culture is not something you can just outline in your business plan, or mark off on a checklist and forget about. It’s something you need to nurture, in many ways like how you should nurture your customers. Think through all efforts to influence and grow your company culture. If the strategy considers both the happiness of your employees and your customers, then you are on the right track. What are your favorite company culture hacks? Please add them in the comments. We’d love to hear your thoughts on company culture, and especially any culture hacks that you have implemented at your company. We’re thinking of creating a “definitive” list of culture hacks on Slideshare if we get enough.